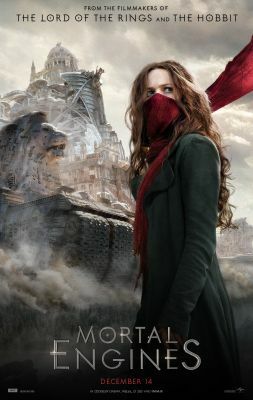 Mortal Engines is based on the young adult novel by Philip Reeve. In the future, the Earth has been destroyed by war. The remnants of humanity have cobbled together their cities into mobile fortresses that roam the desolate countryside looking for ancient technology or other cities to raid for supplies. Living in the city of London is Tom Natsworthy, a young historian who specializes in ancient technology. Orphaned at a young age, Tom idolizes the city’s chief archeologist Thaddeus Valentine. When London chases down a small town and captures it, they unwittingly pick up someone who desperately wants to get infiltrate London. She is Hester Shaw and she has a longstanding mission to kill Thaddeus Valentine for murdering her mother. But after a failed attempt to assassinate Valentine, Hester finds herself stranded in the middle of the hostile wasteland alongside the hapless Tom. As Tom and Hester struggle to survive, he begins to question everything he believed about London and Valentine. And Hester begins to feel emotions that she has long had to bury inside her in order to survive. But as the two come to terms with each other, they realize that London poses a threat to the world bigger than they ever realized and they’re the only two people who can stop it. Mortal Engines is rated PG-13 for sequences of futuristic violence and action. When I heard that Peter Jackson was producing Mortal Engines, my sons and I picked up the book by Philip Reeve. My kids enjoyed the books and eagerly read the sequels. After having seen the movie, I can say that it is mostly faithful to the young adult novel. The core themes are there any most of what was deleted was done so for running time. There are a few key differences, but I won’t spoil them here. The most notable thing about Mortal Engines is the stunning production design. WETA has proven themselves time and again and their quality and attention to detail shines here. The Traction Cities are better than I imagined when reading the books. If you’re at all familiar with real world London you’ll spot familiar landmarks sprinkled here and there on the fortress. (And that’s ironic considering the recognizable landmarks are usually the first thing destroyed in apocalyptic movies.) The costumes are also fantastic. Every extra in the background seems to be treated with the same attention to detail as the lead characters. There are a few of them that looked like they would have been at home in a Star Wars movie. Then there are the airships which are imaginative and unique. It all comes together in an interesting world that is a blend of familiar technology and steampunk design aesthetic. Mortal Engines also has some impressive visual effects and action scenes. The chases between London and the small cities are intense. And the character of Shrike, played by Stephen Lang, is an impressive Terminator knock-off. He’s a disturbing mix of machine and corpse and when he starts fighting, the results are pretty brutal. But it’s not all action and carnage. There is some surprising humor in the story as well. This is the case as they puzzle through the remnants of our civilization trying to figure out what our everyday items were used for. I won’t spoil the jokes here, but they’re a surprising break from the otherwise heavy tone of the story. Most of the cast is filled with new faces which helps sell their characters. Hera Hilmar plays Hester Shaw with echoes of Sarah Conner. Meanwhile Robert Sheehan plays Tom Natsworthy in a way that’s reminiscent of Newt Scammander from Fantastic Beasts. With both of them being unfamiliar actors, you only see the characters on the screen. The same goes for Jihae as Anna Fang. I imagine she’ll be getting a lot of offers for action roles in the future. The only familiar face is Hugo Weaving as Thaddeus Valentine and, as usual, he makes a great villain. Unfortunately, his character doesn’t have as much depth as he did in the novel, but Weaving does the best he can with the material he’s given. As great as many of the elements in Mortal Engines are, it does have its fair share of issues which drag it down. This story is very ambitious in its world building, but it does so at an inconsistent pace. In some parts of the story, this post-apocalyptic world is revealed to us in small bits that the audience discovers at the same time as the characters. But in other parts, the exposition is thrown at you at a breakneck rate. In one scene Tom and Leila George as Katherine Valentine are shown talking about the “Sixty Minute War” and everything that happened in it. Then we’re hit with the social hierarchy of the city as they walk down into the depths of London. Then we’re hit by wanted posters for Anna Fang out of nowhere to establish the conflict that’s going on in the background. It’s a lot to take in and it feels entirely rushed. The story also feels generic and familiar. As previously mentioned, the relationship between Shrike and Hester feels taken directly from Terminator. The big finale feels taken directly from Star Wars. Other parts feel like they came from any dystopian young adult films like Maze Runner, Divergent, or Hunger Games. The cool mobile cities and airships aren’t enough the distinguish it from other stories in this genre. But I guess if you’re going to mimic anything, it might as well be the big money makers. While this story is fantasy, there are parts of it that simply don’t make sense. Ignoring the physics of moving cities, we see London devour a small town for its resources….then welcome their captives with open arms. The whole point of capturing a city was to steal its resources and enslave its people. Why would you add more mouths to feed to a starving city? That is glossed over here and even ignored. The ending of the film is also surprisingly weak. The story kind of ends on a whimper that feels pretty unsatisfying. This screenplay was written by Peter Jackson, Fran Walsh, and Philippa Boyens who all worked on The Lord of the Rings. I expected more from them. As we walked out of the theater, I asked my two sons, who loved the books, what they thought of the movie. “Eh…it was OK.” Then they proceeded to pick apart all of the differences between the movie and the book…as one does. While it’s a great concept with a flawed execution, it still entertained us for 2 hours and provided the big spectacle that you want to see on the big screen. And then it was utterly forgettable afterwards. If you or other members of your family are fans of the young adult post-apocalyptic genre, then you’ll find it worth checking out on the big screen. If not, wait for it to show up on TV.